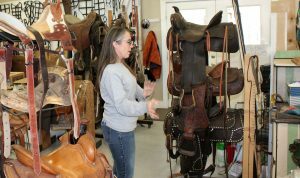 Chris Apedaile owner of Boots and Things Saddlery and Boot Repair, shows off some of the saddles she made. 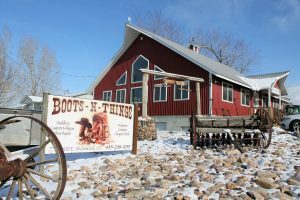 Chris Apedaile, owner of Boots and Things Saddlery and Boot Repair located at 775 S. 100 E. in Richmond, has been in business for 15 years. If it’s made of leather, there isn’t much she can’t fix, remake or repair. Boots and Things Saddlery and Boot Repair, located at 775 S. 100 E. Richmond has been in business 15 years. When talking to Apedaile, you may learn a few new terms. For instance, cordwainer is a person that makes new shoes from new leather. Bespoke refers to being ordered before it is made, and custom made means made to the specifications of a particular person. 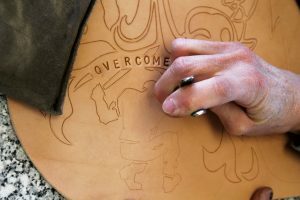 Chris Apedaile, owner of Boots and Things in Richmond, works on some custom saddle bags for a customer. The horse hair experience sparked a 15 year career of all things leather. Her most common projects include belts, chinks, chaps, spur straps, dog collars, knife sheaths, and western holsters. She is also skilled at making horse tack, including breast collars, headstalls and bridles, billets, and rear cinches or flank straps. Apedaile recently worked on some custom saddlebags for a disabled veteran from out of state who helps fellow impaired soldiers learn to ride horses. The design had special meaning to the soldier. Her neighbor, Joshua Lind, made the artwork and she carved the design with care. Her custom boots get the same careful attention. She has different sizes of shoe molds for stretching the leather over for the correct fit. 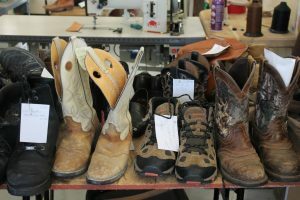 Chris Apedaile, owner of Boots and Things, talks about her collection of saddles she uses for examples of what she can build. She built her shop, located in Richmond, 10 years ago, incorporating large windows to take advantage of the natural light. Her husband, John, works in maintenance, but still partners with her in the shop. Chris said she’s quite handy, and can generally fix all of the aging equipment so it will last. Chris Apedaile works on a custom design she was commissioned to do. She takes pride in her work and loves providing customers with exactly what they want. Boots and shoes waiting to be repaired at Boots and Things in Richmond. 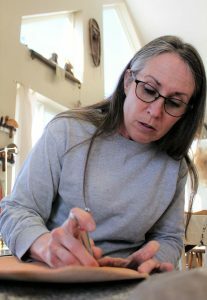 She took a saddle-making class to hone her skills. Apedaile studied with some of the best local artists she could find to learn the trade and nail down her skills.